Physics professor Katrin Schenk was recently awarded a new $43,563 grant from the Alzheimer’s and Related Diseases Research Award Fund (ARDRAF) to develop software that will help caregivers monitor Alzheimer’s patients and improve their caregiving. 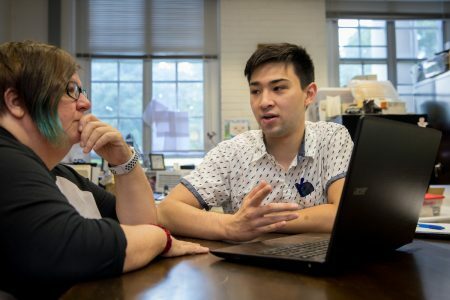 The project, entitled “Interactive Caregiver Portal for the Visualization of Activity and Location Data in an Alzheimer’s Population,” will allow Schenk and other Randolph researchers to build an interactive web application for their functional monitoring system. The app links to data taken by cell phones and smart watches and helps caregivers of Alzheimer’s patients collect patient information and activity data. With the new grant, Schenk and her students will continue subject testing, while focusing their efforts to make the software more user-friendly. The funds will also be used to help facilitate interviews with caregivers using the new technology. This work was supported in part by Award No. 19-7 from the Commonwealth of Virginia’s Alzheimer’s and Related Diseases Research Award Fund, administered by the Virginia Center on Aging, College of Health Professions, Virginia Commonwealth University.